From left to right: Nimish Agashiwala, Shaun Ruddy, Rachel Newland, Aren Bazzocco, Casey Brooks, Elaine Andersen, Mo Rahim, Felipe Rodriguez, Brad Westerbeck, Jay Pawlek, Thaddeus Toste, Daniel Stirn and Mike Hammons. 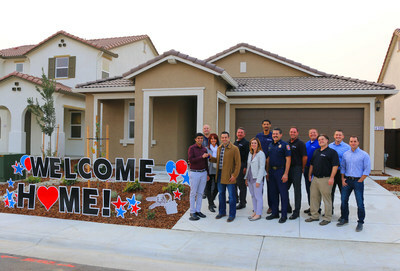 SACRAMENTO, Calif., Nov. 19, 2018 /PRNewswire/ -- Taylor Morrison Home Corporation (NYSE: TMHC), a leading national homebuilder and developer, welcomed home the very first resident at Folsom Ranch on Thursday, November 15, 2018. Nimish Agashiwala closed and received keys to his brand-new Azure at Folsom Ranch home—a single-story Cobalt plan featuring 1,784 square feet with three bedrooms and two baths. Joined by city officials including City Manager Elaine Andersen, Fire Chief Felipe Rodriguez, and Police Chief Rick Hillman, a group of Taylor Morrison team members led by Division President Aren Bazzocco held a brief closing ceremony with Agashiwala to mark the momentous occasion. Agashiwala is the first of 13 Azure buyers that will receive keys to their new homes in 2018. "Taylor Morrison is excited to be part of Folsom Ranch and honored to be building the community's very first homes," said Aren Bazzocco, Sacramento division president for Taylor Morrison. These Azure homes are the first of approximately 10,000 that will be built in the master-planned community of Folsom Ranch—a new development south of Hwy 50 in Folsom, CA. Taylor Morrison started building the community's initial homes at the beginning of summer and plans to close 10 homes per month through 2019. "Our Azure residents are in a truly unique position— they will experience all the 'firsts' here at Folsom Ranch and help bring the vision of this incredible new community to life," added Bazzocco. Thoughtfully designed from the ground up, Folsom Ranch will eventually offer over 1,000 acres of open space, 138 acres of parks and several new schools at completion that will be fully connected by over 30 miles of paths and trails. Easy access to Hwy 50 and premier shopping, dining and entertainment at the Palladio are just a few of the nearby attractions that residents will love. Historic Sutter Street is just a short drive away, and home to variety of antique shops, restaurants, boutiques, and year-round family activities including arts & craft festivals, an ice-skating rink, Folsom Live and more! There's no need to travel far for live theater and music—hosting some of the area's best headliners, the Harris Center at Folsom Lake College is located within a 15-minute drive from the community. Priced from the low $500,000s, Taylor Morrison offers two stylish collections of single and two-story homes at Folsom Ranch – Azure and Dakota. Azure homes range in size from 1,784 to 2,768 square feet with three to five bedrooms, two to three baths and a two-car garage. Highlighted by expanded living areas and pool-sized homesites, Dakota offers four home designs ranging in size from 1,891 to 3,063 square feet. Homes feature spacious center-island kitchens with generous pantries, first floor bedrooms, convenient owner's entries with built-in storage, and upstairs lofts in the two-story homes. A variety of options are available for personalization including multi-gen suites, GE® Monogram appliances, fireplaces, frameless showers, surround sound, floating shelves and more. For more information on these new communities, please contact an Azure and Dakota community sales manager at (916) 686-7470 or visit TMFolsomRanch.com. To visit the community, take Hwy 50 east and exit at E Bidwell/Scott Rd; head south on E Bidwell and follow the signs to the sales center. The Folsom Ranch sales center is located at 4312 Needlegrass Drive, Folsom, CA 95630. To receive the latest news about Folsom Ranch or any Taylor Morrison Sacramento community, visit TaylorMorrison.com or Facebook.com/TaylorMorrisonSacramento/.